Following a record-setting college career in which he rushed for 3831 yards and broke Bo Jackson’s school record with 45 touchdowns, Carnell “Cadillac” Williams was taken in the first round of the 2005 NFL draft (fifth overall). He was prized for his versatility and had an immediate impact. However, after a fast start to the 2005 season in which he rushed for 434 yards in the first three games, he missed two contests due to injury, setting the tone for his career. 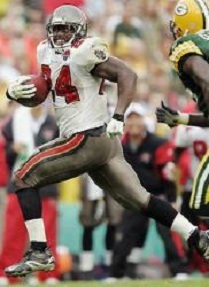 Buccaneers went 11-5 to finish first in the NFC South. Lost NFC Wild Card playoff to Washington Redskins (17-10). Williams suffered a foot injury in 2006 and, with the team sinking below .500, was often not a factor in the second half of games. He rushed for 798 yards and caught 30 passes for 196 more. Williams appeared in just 10 games combined in 2007 and ’08, due to two major knee injuries, but bounced back in 2009 to run for 823 yards. Used more in third down situations in 2010, he caught a career-high 46 passes for 355 yards while gaining 437 yards on the ground. Williams moved on to the St. Louis Rams as a free agent in 2011, backing up Steven Jackson. For his injury-marred career through 2011, he rushed for 4038 yards on 1055 carries (3.8 avg.) and had 148 pass receptions for 1002 yards with a total of 25 TDs.